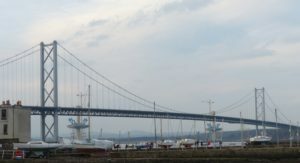 A road rage driver, who slammed on his brakes on the Forth Road Bridge to cause the car behind to crash into him, has avoided being disqualified. Ross Mathieson carried out an emergency stop without any reason on the southbound carriageway. He then laughed at the motorist who ran into him, Dunfermline Sheriff Court was told. The incident was described as “extraordinarily stupid driving” by a sheriff who fined Mathieson £3500. He had apparently become frustrated by a driver in front of him who was keeping within the speed limit. Mathieson (42), of Caledonian Court, Falkirk, was found guilty after trial. He had denied that on 16th January last year on the Forth Road Bridge he drove culpably and recklessly by driving his car too close to another car, overtook from the inside lane and braked suddenly, without reason and caused a collision. Mathieson was travelling from Dunfermline to pick up his child when the incident occurred. William Graham (61), told the court he was driving south on the bridge with his partner and had put his Saab convertible on cruise control to comply with the 40mph average speed restrictions in place there. He was overtaking two cars and when he looked in his rear mirror he saw a silver car had appeared closed up behind him. This car, driven by Mathieson, had then overtaken him in the inside lane before pulling in front of him, said Mr Graham. Mr Graham was unable to stop in time and collided with the Nissan Qashqai driven by Mathieson. “He got out of the vehicle on the bridge. I drove off the bridge at a crawl and stopped just off it,” said the witness. He said the impact left his car with two damaged wings, the bonnet was crumpled and the headlights were both smashed. Peter Macari (28), a banker, witnessed the incident as he drove behind the two vehicles involved. He recalled, “There was absolutely nothing in front of the car,” when Mathieson braked. Mr Macari said he spoke to the couple in the Saab and they both “shaking and in shock”. Mathieson, a self-employed civil engineer, said the incident occurred when Mr Graham puts his lights on full-beam behind him, which had temporarily blinded him. Sheriff Derek Reekie found him guilty and was told a disqualification would mean Mathieson would lose his current job. The sheriff imposed a fine of £3500.